I’ve got not just one but TWO polishes up for review today! 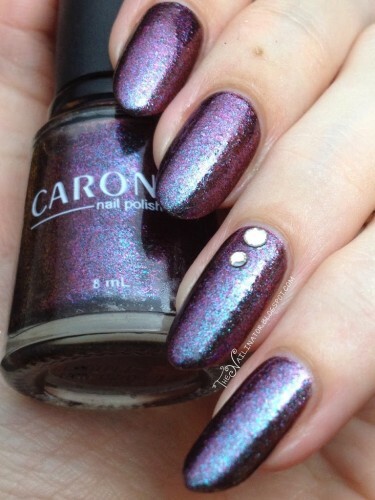 Both are by a local polish brand Caronia. First up is Trance which is what I would describe as a purple foil. It is VERY shiny and oh so pretty! Those of you who have been around a while know by now that I have a special place in my heart for purple polish. I used 2 coats here. The formula was a bit thick but easy to handle. Clean up was very easy and I wore it all day without top coat and had no wear on my tips. Two thumbs up from me. 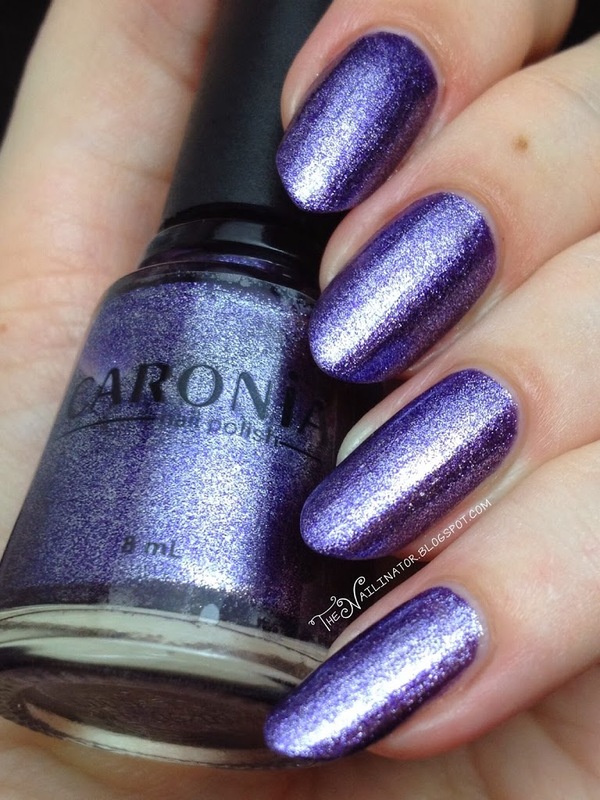 I actually put off buying this one because I thought it was too similar to Amethyst by Chic which can be seen here. They are actually quite different. 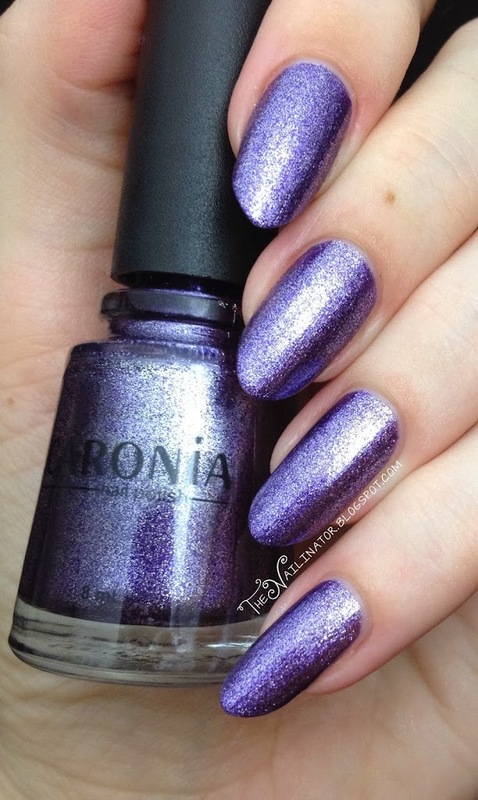 While Amethyst has glitter bits and dries to a semi-matte sort of textured finish, Trance is a foil with a shiny and smooth finish. Next up we have Moonlight which I would describe as blue and purple shimmery duochrome glitter in a black jelly base. I’ve used two coats over Trance here because I already had it on and I wanted to make sure I had no VNL. After applying it, I think I could have gotten away without the base. Isn’t it pretty? I picked it up a couple of weeks ago. I had not seen this shade before and I was surprised by it. I haven’t had much experience with duochromes and multichromes. I think this would be a duochrome but I also noted gold tones in certain lighting. I could not photograph it though. If you have any tips on photographing these types of polishes, I would love to hear them. After applying topcoat (which bubbled a bit because it had been raining for almost 2 weeks straight) I added a little Swarovski crystal accent. I purchased these from Blooming Nail Cebu. Which is your pick of the two? 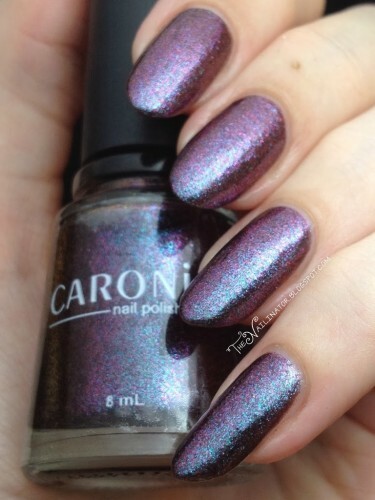 Both of these Caronia polishes are available in department stores, grocery stores and pharmacies in the Philippines. These shades come in 8ml bottles for approximately 34.75 Philippine Pesos. What do you think of my review post? I’m still getting the hang of describing polishes for you. I would love to hear your feed back or any suggestions of what other info to include. Please leave a comment. I hope you have a great weekend! Coooool! I have been searching for Moonlight for months now. I hope I see it here. It looks really good on you! Thanks! I was really surprised to find it here. It was mixed up with the black so I almost missed it. So pretty jud! If I ever come across any of these two (which is unlikely, but nonetheless) I’ll buy them on the spot. They’re gorgeous! They are aren’t they? Thanks for the comment hun! It’s lovely. I wonder why I keep putting off buying trance. I’ve never heard that caronia also has duochrome. I’m gonna be searching for that. It looks nice on you btw.